You save$16.68 on quantity of 6 bulbs over �each� price on this variety. 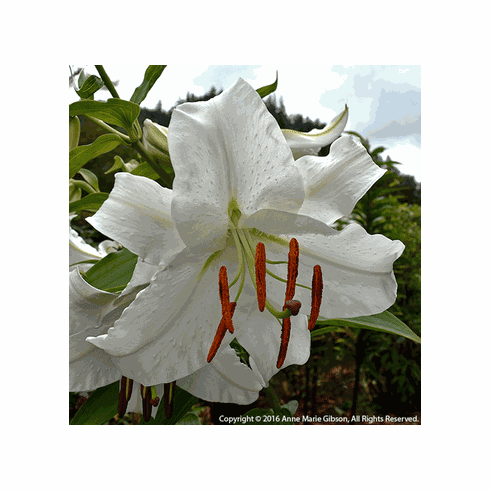 Like the sun-bleached walls of sunny Morocco, the pure white 'Casablanca' lily has both stature and character. These often 5 to 6-foot pillars of majestic 10-inch blooms will anchor your pink and blue perennial border in midsummer. Hands down, the classy and fragrant 'Casablanca' has been the most popular Oriental lily in any of our catalogs since we introduced it to the North American garden market in 1987. If you have not yet tried 'Casablanca' doing so now could be the beginning of a beautiful friendship. 5 to 6 feet. Late July / August Flowering. Yummy Fragrance.